Winter crochet projects are always fun to work on because they're plush, comfy, and specifically designed to keep you warm. It makes for a cozy activity to craft when it's cold out, too. This collection of crochet patterns includes everything you will need to layer up from head to toe each winter and keep out the chill. Wind this scarf around and around to stay as warm as possible. Or let it hang down and stuff your hands into the roomy, cozy pockets. This free crochet pattern is very versatile, especially when worked in the suggested neutral color palette. It is the perfect winter crochet accessory. Cover up your entire head with this extra warm crochet hood. It's better than a hat because it extends all the way down the back of your neck, closing the gap between your head and your jacket. It has a cable design that is nice and dense, creating the outline of a tree along the back of the hood. Faux fur surrounds the face for that perfect winter fashion statement. Believe it or not, this is a free crochet pattern, offered as a download through Ravelry. These crochet leg warmers will keep you nice and toasty. They also make a bold fashion statement, dressing up your jeans or leggings with a big pop of color. Although they are worked primarily with basic crochet stitches, you will have the opportunity to practice a few special stitches, including shell stitch and the little-used long double crochet crossover. Don't worry if those are new to you; there are video instructions to accompany the written crochet pattern. This pattern is for sale through Ravelry. The designer of this pattern was inspired to make this accessory because she wanted something warm but fancy that she could wear over holiday dresses in the winter. This wrap also works just as well over casual clothes to keep you warm while doing holiday shopping and other errands. This pattern uses a simple one row repeat and implements the interesting texture of the side saddle stitch. The recommended yarn has a subtle metallic sparkle to it. This infinity scarf is the cutest way to bundle up and keep warm. Avoid the struggle of fighting long scarves blowing in the wind and bury your face into your cozy circular scarf when the air starts to hurt your face. Do you hate the hassle of wearing mittens or gloves because you need to be able to easily set your hands free in order to use your phone? A crochet muff is an old-fashioned solution that's making a comeback. This one is worked in double crochet using a variegated yarn that naturally creates a checkerboard look for the accessory. Created using super bulky yarn and a size N crochet hook, this is a winter crochet pattern that works up really quickly and keeps you warm right away. Not into the muff? Crochet fingerless gloves are a more modern and still stylish solution. This project is ideal for beginners and can be stitched up in a cinch. Crochet ear warmers are great to have on hand during the winter. The best kind are just like this one–double thick when worked with two strands of yarn held together, and wide to completely protect your ears from the cold. This pattern is special, too, because it uses the counterpane stitch, which is a very rarely used crochet stitch that you'll find fun to learn. Boots are the go-to shoes for winter. Make yours more feminine and flirty and add another layer of warmth at the same time by topping them off with this free crochet boot cuffs pattern. In addition to basic crochet stitches, this pattern incorporates post stitches, puff stitches, and working in the third loop only. That makes them a pleasurable challenge to craft even though this is a relatively small accessory. Tamara Kelly was smart when she designed this crochet scarf; she chose a baby yarn in a sophisticated color palette to make a super soft scarf for grown-ups. The pattern incorporates the little wave stitch, her stitch pattern that has a slightly undulating, slight zig zag design. Thanks to a smart drawstring (pom pom optional) this is a scarf that can pull tight against your skin to make sure no winter wind gets in. 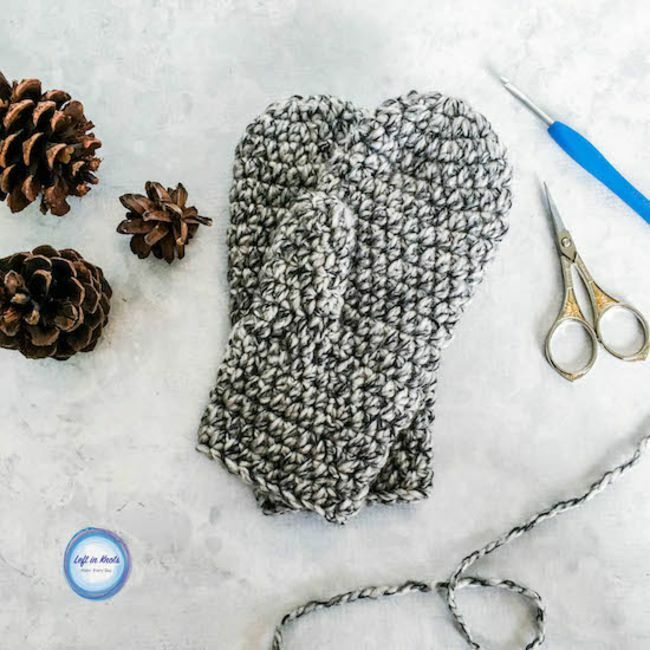 These thick mittens can be completed by a beginner crocheter who knows half double crochet and can do some simple shaping. The designer also has a matching ear warmer pattern for a nice winter crochet accessories set. You might go barefoot around your house in the summer, but during the winter months you probably wear socks. These crochet socks are so cute with their spiral heel and the color pattern that is opposite from left to right sock. Spiral Crochet Socks by Ooh I Love It!